If you’ve always fancied yourself as a bit of a sleuth then here’s the perfect opportunity to show your skills as you link up with Sherlock Holmes and Dr Watson as they pursue the slippery Lord Blackwood. 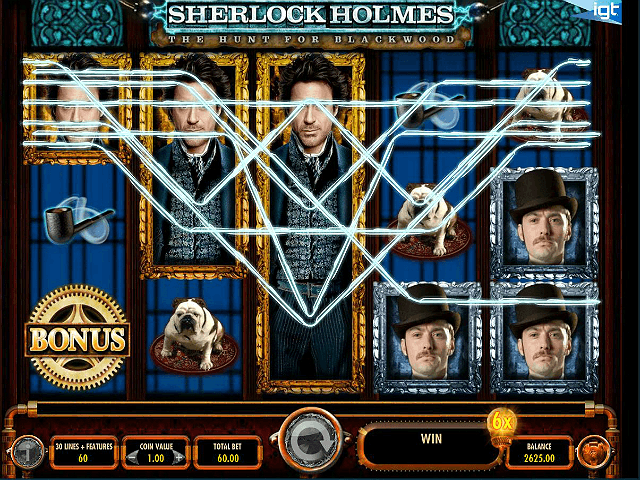 This IGT slot game is based on Guy Ritchie’s 2009 movie with Robert Downey Jr as Sherlock and Jude Law as Watson. Proceedings are dark and full of suspense as you navigate your way towards the cash prizes on offer. 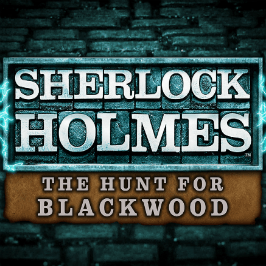 There are, by our reckoning, five bonus rounds and special features in total in this Sherlock Holmes: The Hunt for Blackwood slot game, and you know what that means. Lots of lovely pay-outs to spin for. Play Sherlock Holmes: The Hunt for Blackwood for Real Money! 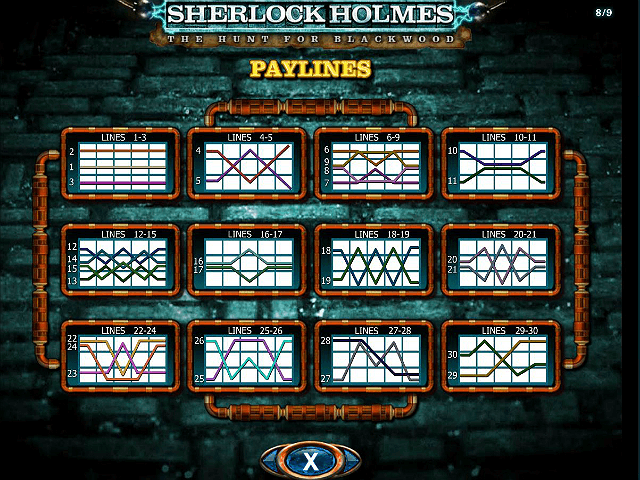 Finally, there’s the Sherlock Holmes game logo, which pays out 50, 150 and 500 coins for matching three through to five respectively. 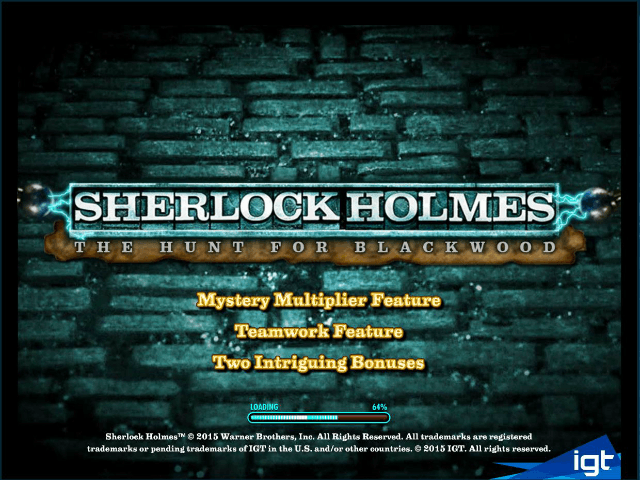 As mentioned, there’s a stack of special features to be triggered in the Sherlock Holmes: Hunt for Blackwood 3D slot machine, and so we’ll start with the most straightforward. The Mystery Multiplier feature is, simply, a multiplier of up to ten-times that appears at random during the main game. You can’t say fairer than that. Then we have the Teamwork feature. On any given payline, when Watson and Holmes appear alongside each other they can merge into a combined symbol of some detective power. These pay up to 300 coins for a full set of five. The game features a bonus icon, which appears periodically. Land three of these on reels one, three and five to trigger the Picker Puzzle feature. 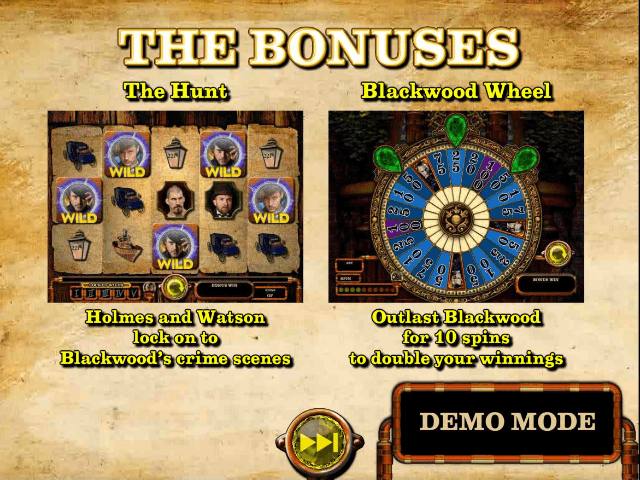 Here you have five picks and can select items from Holmes’ office, which reveal cash prizes or trigger further bonuses. The Cash Award prize earns players multipliers and extra picks, while three Scrolls earns ten spins in the Hunt Bonus and four pays 15. Three or more of the Wheel sign triggers the Blackwood Wheel feature. The Hunt Bonus is essentially a free spins round played on a map-based reel set, with locked wilds and bonus doublers available. The Blackwood Wheel feature is your standard ‘wheel of fortune’ style game, and contains lots of fantastic cash prizes and bonuses. The Sherlock Holmes: The Hunt for Blackwood slot machine offers plenty to hold your attention as you play, deerstalker and pipe not required! Share this Sherlock Holmes: The Hunt for Blackwood Review today! If you like Sherlock Holmes: The Hunt for Blackwood, you'll love these slot titles too!